I would be happy to give clarification. What was meant was simply happy new beginnings and happy old endings. ~ Giving thanks for the journey thus far. Life is always in a ‘recycle’ program. Giving gratitude for your experiences last year is a beautiful way to welcome in the new experiences of this year, 2014. 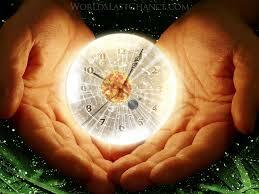 Time is only an illusion to serve third dimensional experience. It categorizes and marks future and past events. ‘Now” is the time to focus on. You can reflect (past), project (future) and be (now). However you wish to experience is your choice. No longer is Earth tied to time constraints. It is in the past, pun intended! So take a deep breath and relax. Give gratitude to your life thus far. Give gratitude to the potential each of you has. And then come back to Now. Now is all there truly is, time-wise. Love is all there is energy-wise. Meditate, allow and be happy. Happy New Year & Happy Last Year! “Time” as you know, is an Earth requirement. Time is most definitely speeding up and is doing this so that you (humanity) and Gaia enter the 5th dimension “on time”. ~ That was a play on words! However “time” is no longer able to be measured as it once was. This is felt now as time-lapses, as instant manifestations, as days and hours seem to vanish into thin air. This is a necessary requirement to help humanity make its jump into the new consciousness. Imagine no longer wearing a watch. Imagine that all events happen when and how they should for the highest-greatest good of all those involved. Imagine having true faith that all is well and doesn’t need to be kept on schedule. Would that look like chaos? Perhaps to some. To others it looks like freedom. It feels like truth on an innate level. Give some credit to the cosmos who has perfectly arranged all life without the assistance of a wrist watch. Yes, time is important on Earth. It has guided you in a purposeful way on this long journey of third dimensional life. The New Earth is well under way. Give thanks that humanity as a whole (conscious, subconscious and otherwise) has given its blessing to move forward. Be more aware now of your feelings and know what you specifically ask for will be coming to you much quicker. This will require you to be mindful of your thoughts. Love full heartedly. Forgive easily. Help others by your example. This is the way life is Now. Thanks Suzanne … the energy I am still getting is .. 2014 is the last year for the illusion of ‘time’ and therefore .. we don’t have to name a day, a month .. or a year … I AM saying goodbye to the illusion of ‘time’ and so it is and it is so. Namaste.